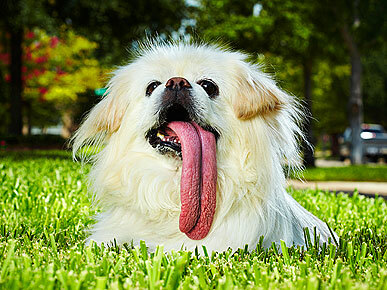 Toronto Dogs Directory: What's The Longest Dog Tongue Ever Recorded? - Find Out The Answer And Check Out These Other Incredible Animal Records! What's The Longest Dog Tongue Ever Recorded? - Find Out The Answer And Check Out These Other Incredible Animal Records! - Longest tongue on a dog : Puggy (pictured), with a 4.5 inch licker! - Oldest dog ever recorded : Bluey, an Australian Cattle Dog who according to an anecdotal report, lived 29 years, 6 months and 12 days. - Oldest cat ever recorded : Creme Puff, who died at age 38 years and 3 days. - Pet most likely to outlive its owner : I always thought it was the Macaw, which can live up to and over 50 years, but it turns out the Box Turtle can live up to 100 years. - 40 million Americans own pet birds. - Studies have shown that cats have better memories than dogs, monkeys or orangutans. - Cats spend almost 30% of their lives grooming themselves. - Goldfish have a memory of up to three months, not three seconds, as many believe. - Cats almost never meow at other cats, just us. - The largest dog ever recorded is Zorba, a 343 lb Mastiff. - A human year is 25 hamster years. - On average, cats sleep 16 hours a day, while dogs sleep roughly 14 hours daily.